Colorado’s four National Parks are a showcase of the state’s most dramatic landscapes. Explore some of Colorado’s highest highs, deepest depths and curious quirks with these fun facts — and then head out to see them in person! Draped along the Continental Divide between the towns of Estes Park and Grand Lake, Rocky Mountain National Park is one of the nation’s most popular parks. • It’s also the nation’s highest altitude National Park, with 415 square miles of hiking, camping and sightseeing fun. Inside, you’ll find panoramic alpine views of more than 60 peaks that rise above 12,000 feet. • Surprisingly, there’s only one fourteener inside the park’s boundaries: Longs Peak checks in at 14,259. It’s the 15th tallest of Colorado’s 58 fourteeners. The park’s lowest elevation is 7,624 feet — that’s a nearly 7,000-foot elevation gain from top to bottom. • A whopping one third of the park is tundra — above the altitude where trees can grow. That doesn’t mean there isn’t vegetation. Look closely to spy the tiny plants that form a dense flowery, green carpet along the park’s upper reaches. • One of the park’s favorite routes for exploration is Trail Ridge Road. 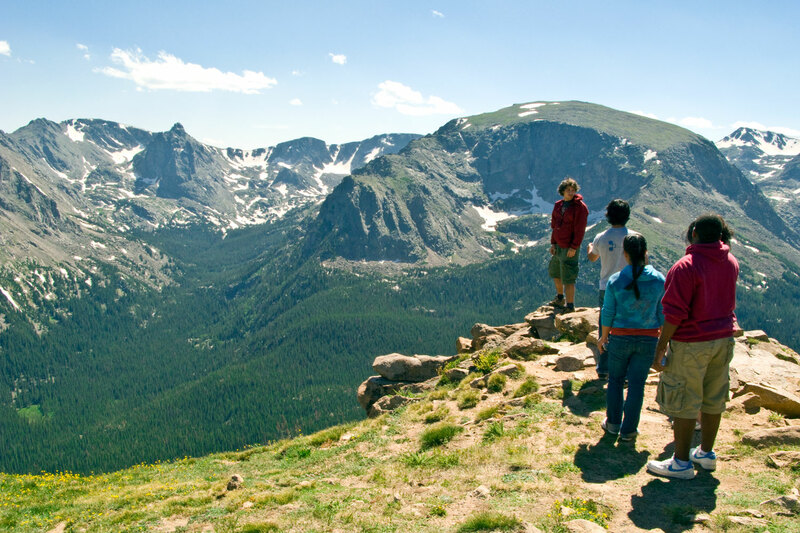 Peaking at an altitude of 12,183 feet, Trail Ridge is the highest through road in the nation. In the winter (when the road is closed), it can be covered by up to 20 feet of snow. • Park the car to walk along Rocky Mountain’s 300 miles of hiking trails, and cool off beside one of its 150 lakes and 450 miles of streams. 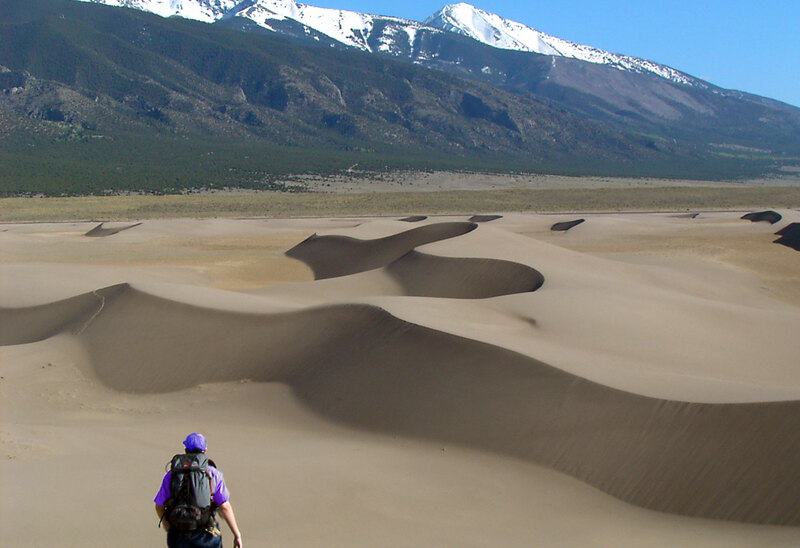 Nestled in a spot where the Sangre de Cristo Mountains buckle inward north of Alamosa, the Great Sand Dunes have been building and sifting for eons — the result of the San Luis Valley’s unique wind patterns. • This sandbox of epic proportions measures 30 square miles and is estimated to hold more than 5 billion cubic meters of sand. Imagine the size of the sand palace you could construct! • The dunes are the tallest in North America, with the tallest, Star Dune, rises 750 feet from base to breezy crest. It’s a three-mile hike from the trailhead to Star Dune, but if you’re not feeling quite that adventurous, you can make it to the second highest — 650-foot High Dune — in just 1.25 miles. • If you’re headed out on those hikes, be sure to wear sturdy boots or athletic shoes (no sandals), as the sand can get up to 140 degrees on steamy summer afternoons — even when the park’s temp isn’t above 80 degrees. • This National Park isn’t totally sand crazy. Beyond the dunefield, there’s a diverse landscape, with five named alpine lakes (and many smaller, unnamed ones) and thick forests where some of the narrow-leaf cottonwood trees are more than 300 years old, as well as grasslands, wetlands and tundra ripe for exploration. 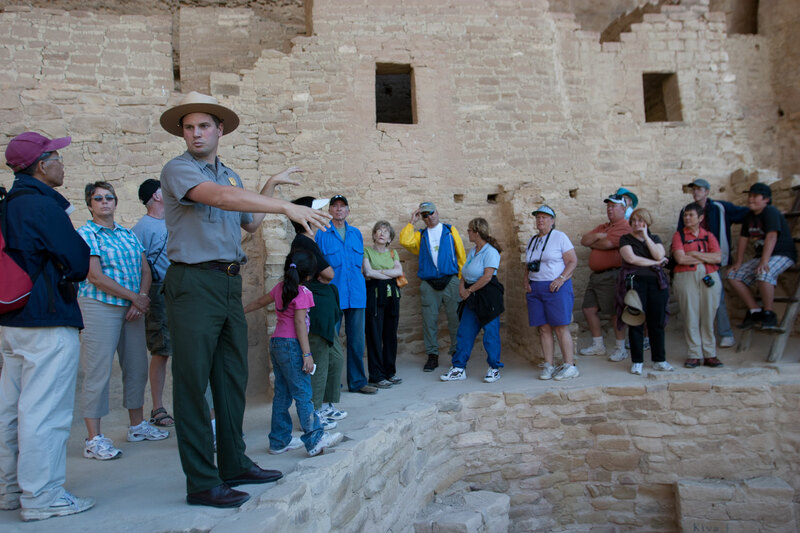 • Mesa Verde National Park is home to more than 4,700 archeological sites, including pueblos, masonry towers, farm structures and 600 cliff dwellings. Tours are available (ranger and self-guided) to five of the dwellings. Additionally, there are more than 20 mesa-top sites you can visit on your own. • Mesa Verde’s original residents lived in the area 1,400 years ago. According to National Park Service, 24 American Indian nations consider Mesa Verde their ancestral home. • Cliff Palace is the park’s largest dwelling. Researchers believe approximately 100 people lived among its 150 rooms and 23 kivas (ceremonial structures). • Though the park’s semi-arid landscape makes it hard to imagine, 282 seep springs can be found just in Cliff House alone. Seep springs are created when water is absorbed in the pores of the sandstone and works its way to the cliff face. The Black Canyon, so named because the walls are often shrouded in shadows making them appear black, is one of Colorado's most dramatic landscapes. This spot, between Gunnison and Montrose, is perfect for scenic drives where can you peer into the often guardrail-less edge to see the Gunnison River below. 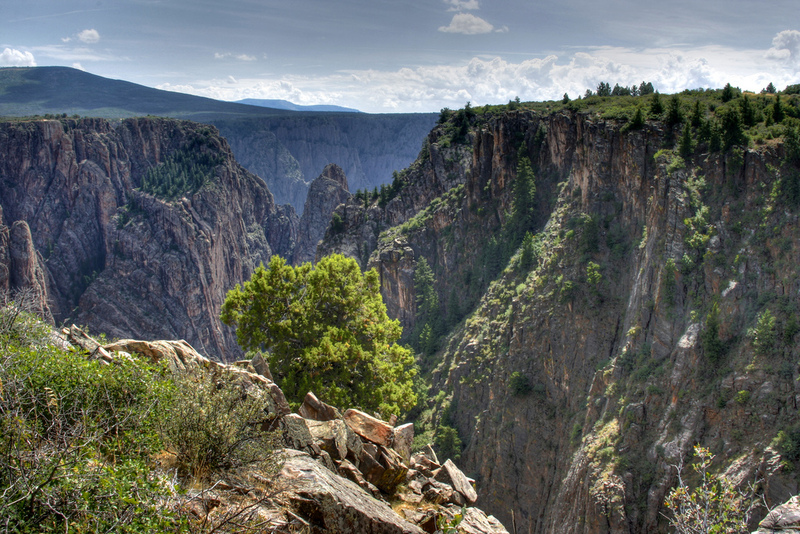 • The Black Canyon of the Gunnison is 48 miles long. At its deepest, darkest reaches, it drops 2,722 feet; its greatest width is 1,100 feet across; and its narrowest span is only 40 feet across. • Not impressed? As you gaze into the canyon from one of the park’s many overlooks, consider that it took the Gunnison River 2 million years to do its eroding work on the canyon’s hard rock. • Painted Wall, the park’s most recognizable geological feature, rises 2,250 feet up from the river and is Colorado’s tallest cliff. The wall’s distinct, veiny white streaks are pegmatite, a type of granite comprised of quartz, feldspar and mica. • Seven is the number of miles you will travel into the Black Canyon on the Morrow Point Boat Tour (beginning of June through Labor Day), where you’ll learn more facts about the canyon to amaze your friends with and see landmarks like Chipeta Falls, the Curecanti Needle and Pioneer Point. Read Quick Guide to Colorado National Parks. Or websites for each park are packed with more fun details, information on ranger tours, Junior Ranger activities and photos. The best way to understand the wonder of Colorado’s National Parks is to visit them!